Last week I was honoured to chair the Publications Committee of the Society of Nautical Research at the National Maritime Museum, Greenwich. I was appointed to replace the interim chair, Admiral Sir Kenneth Eaton, towards the end of last year, but last week was my first time in the chair. The Society was founded in 1910 and encourages research into matters relating to seafaring and shipbuilding, the language and customs of the sea, and all subjects of nautical interest. The Society plays a major role in promoting international scholarship in naval and maritime history, preserving the nautical heritage of the UK, and recognising excellence in historical research and preserving maritime heritage through a number of awards. Since 1911, the Society has published The Mariner’s Mirror, the leading international journal of naval and maritime history, and all aspects of seafaring and lore of the sea. The Mariner’s Mirror promotes the work not just of established academics and professionals, but also talented and enthusiastic independent scholars and new researchers. The Honorary Editor of The Mariner’s Mirror is Dr Martin Bellamy, the Research and Curatorial Manager at Glasgow Museums. 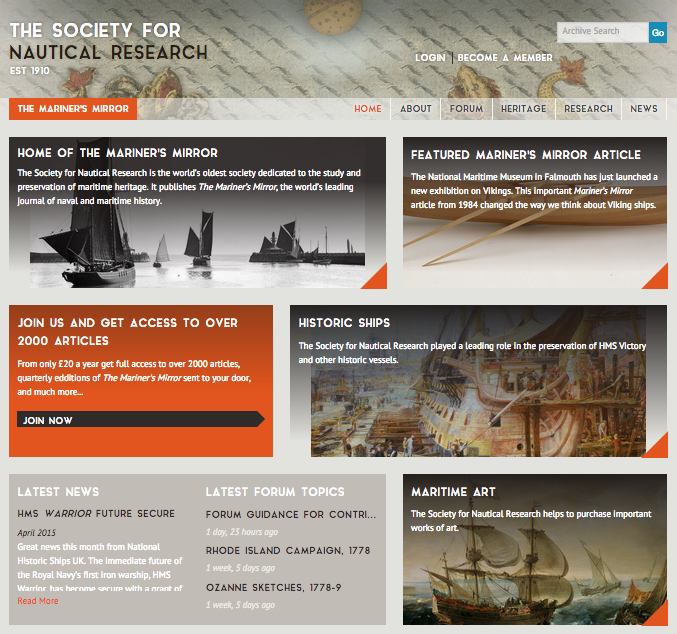 Over the last few years the Publications Committee has undertaken a number of new initiatives to publicise the Society’s work, including a new website and twitter account (@nauticalhistory) which was launched at the end of last year. I’m delighted to take on the role of chair of the Publications Committee in order to continue this exciting work and I’m very pleased to have the support and guidance of Dr Cathryn Pearce, as Secretary of the Committee. This entry was posted in history and tagged history, research, snr. Bookmark the permalink.